Haxey Hood 2008. Ian Clayton and Martin Oxley getting stuck in to the sway. Ian Clayton reflects on the long tradition of the Haxey Hood game, a sort of mass scrum of beer drinkers, which ‘stands head and shoulders for me above anything I’ve ever seen to do with pubs’. During the most recent hood, only one of the four pubs usually involved was open. When I wrote It’s The Beer Talking, I wanted to include a section about pubs and folklore. There was no contest in my mind about what particular folklore I should write about. ‘The Haxey Hood Game’ stands head and shoulders for me above anything I’ve ever seen to do with pubs. The game takes place on the twelfth day of Christmas (January 6) every year in Haxey and Westwoodside, two villages in the Isle of Axholme in North Lincolnshire. Unless the 6th falls on a Sunday, then it takes place on the day before. The locals will tell you that the game has taken place for going on seven hundred years, and that it celebrates a day when the local landowner’s wife Lady Mowbray had her hood blown off in the breeze while out riding. The hood was returned to her by some local farm labourers. Lady Mowbray, impressed by the act of chivalry, suggested that the event should be re-enacted each year on some fields she donated for the purpose. Since then a whole series of rituals has grown up: the singing of songs like ‘John Barleycorn’ and ‘Farmers Boy’ and the ‘smoking of a fool’ act as a preamble to the main action, all this in colourful folk costumes. The main action starts on fields between the two villages when a leather cylinder – the hood – is tossed into the air and then ‘the sway’ begins as people of all ages try to move the hood this way and that. These days the point of the game is to sway the hood towards one of four pubs: the Kings Arms, Duke William and The Loco in Haxey and the Carpenters Arms in Westwoodside. The game ends when the landlord or landlady of one of these pubs takes hold of the hood. The hood is kept at that particular pub until the following year. In some ways the game is an ancient form of rugby, but one without too many rules and with no restriction on player numbers. Anybody can take part and some years hundreds of players join in. It’s truly a community event, with people of all ages and backgrounds taking part. It’s a tough game and, depending on the weather, it can get very muddy. There is no time limit, nobody seems to know what time it starts and it can go on until well after dark. The local pubs take the precaution of removing all breakables from their rooms and lining furniture and carpets with protective sheeting. I’ve been to it a couple of times. The last time in 2008 when I went with Martin Oxley my old drinking partner. We joined in with the singing and drinking and the laughter as the fool was smoked. The game started late that particular year, I think it was coming dark by the time we got up onto the fields. We were also plaiting our legs with the amount of ale we had supped. We didn’t want to miss anything so we started drinking at noon. For some reason Martin decided we ought to push with the lads and lasses from Westwoodside. For an hour or so there was a concerted effort to get the hood up the hill, from where it would have been an easier shove down the other side to the Carpenters Arms. Try as we might the sway barely budged. In fact it barely budged from the field for at least two hours. Eventually the sway appeared in the village high street at Haxey and after further struggles made its way that year down to the Kings Arms at the other end of the village. Martin and me had retired from it by then and supped some more in the Duke William. To be in that sway is an exhilarating experience. It’s colourful, rough and very sweaty and muddy. The whole thing moves around like something from nature, perhaps like a murmuration of starlings preparing to roost does. People do get hurt occasionally, but you’d expect that on a muddy field when hundreds of people are pushing and shoving, yet it’s all done with great humour and stewarded by experienced men called ‘The Boggins’. These men ensure that when the sway collapses and people are off their feet, the game stops until everybody is up again. You can’t run with the hood, throw it or pass it, it must simply be swayed until it gets to where it’s going. As an example of a community based game, I don’t think Haxey Hood has an equal. And because it is connected to local pubs, it is an important part of social life and friendship and an important reason why pubs are there in the first place. I’ve heard that the age old folklore and pub culture of this year’s Haxey Hood was disturbed by modern issues. From what I can gather, the Kings Arms is currently closed down, as is The Loco. The Landlord at the Duke William decided not to open on the day of this year’s event, leaving just the Carpenters Arms to sway the hood to. Apparently the landlord at the Duke William has had some sort of falling out with the local community after a failed planning application to turn the pub into houses. In these times of pub closures and attempts and campaigns to keep them open, it seems to me that the good folk of Haxey have an inarguable right to retain their public houses. There won’t be many places you can go to that has a pub connected to a tradition that goes back seven centuries. 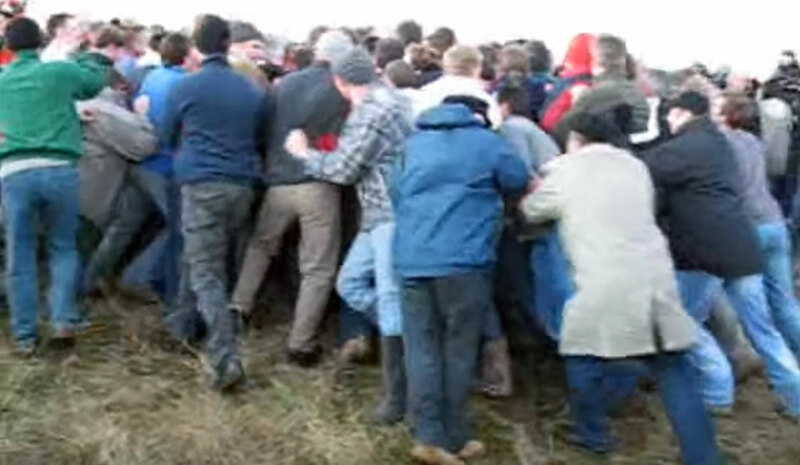 Here’s footage of the Haxey Hood in 2008. You can clearly see me and Martin Oxley getting stuck in at 5.35. I’m in my tweed overcoat and beret, Martin has his black captain’s hat on and a blue cagoule. Prior to the recording of Blood on the Tracks, Bob Dylan previewed his set of new songs to a handful of friends, including Mike Bloomfield, Shel Silverstein, Jerry Garcia, Stephen Stills and Tim Drummond. One such lucky one-man audience for a preview was Peter Rowan. Dylan had written the songs that would appear on the album on his trusted Martin guitar, only for it to be stolen from his van before the recording. Bob turned up at Rowan’s place looking to find a replacement Martin, and while he was there, treated Rowan to a performance of the new songs. In this extract from Clinton Heylin’s monograph No One Else Could Play That Tune, Rowan recounts his amusement of the occasion. [Dylan] was already sequencing the songs in his head while continuing to preview them for friends and other strangers. One such lucky soul was country picker Peter Rowan, who first met Dylan at Newport back in 1965, when he was a member of Bill Monroe and his Bluegrass Boys. Club 47 owner Betsy Siggins had done her best to persuade Rowan to ‘hang out, [insisting] that Bob was a friendly sort, but I was intimidated by the invisible wall that seemed to surround him’. Rowan had crossed Dylan’s radar again because of his association with Grisman, with whom Dylan had recently started taking mandolin lessons. The loss of his favourite Martin, meanwhile, would resonate throughout the rest of 1974. The loss of the guitar on which he had written this extraordinary body of songs was something Dylan would come to interpret as one more cruel twist of fate, even as he euphemistically informed John Mankiewicz in 1978 that he’d ‘left it behind. I’d squeezed it dry.’ In truth, he was still trying to replace it when he turned up at Sound 80 studios in Minneapolis two days after Christmas, hoping to reproduce the vibe the songs had when he still had his trusted Martin. No One Else Could Play That Tune: The Making and Unmaking of Bob Dylan’s Masterpiece is a limted edition mongraph available exclusively from Route. Get your copy here.